Blog dedicated to celebrating a full life! Favorite Posts – So Far! Quick Visit to San Francisco – (Honeymoon Part 2 – 5-7 July 2012)! Things to do in San Diego! 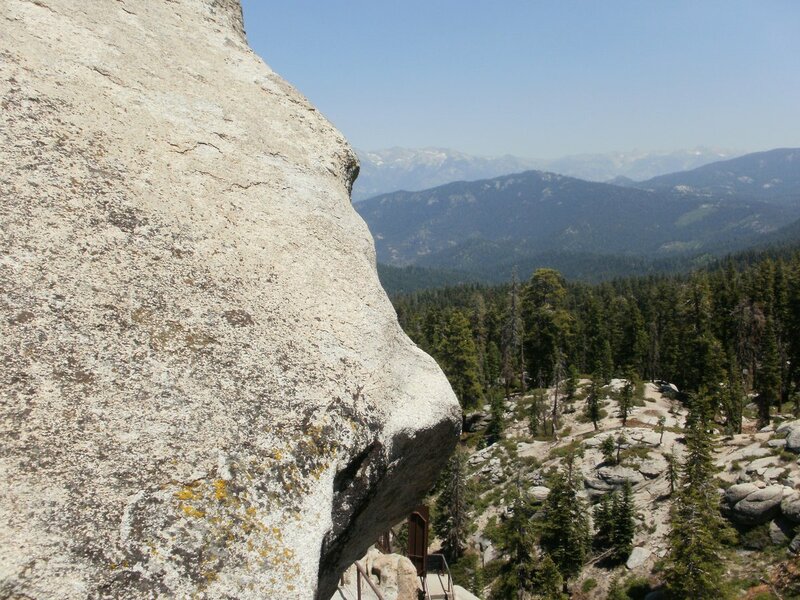 We had a terrific time car camping in Sequoia National Forest and I would give Stony Creek Campgrounds a strong recommendation if you are more concerned with being close to nature than with the amenities. On the third morning we broke down camp and said our goodbyes. We were not done though. Based on my Brother-in-Laws recommendation we headed over to see the Lookout at Buck Rock. This was a new place for me, and I’m really glad we took the time. 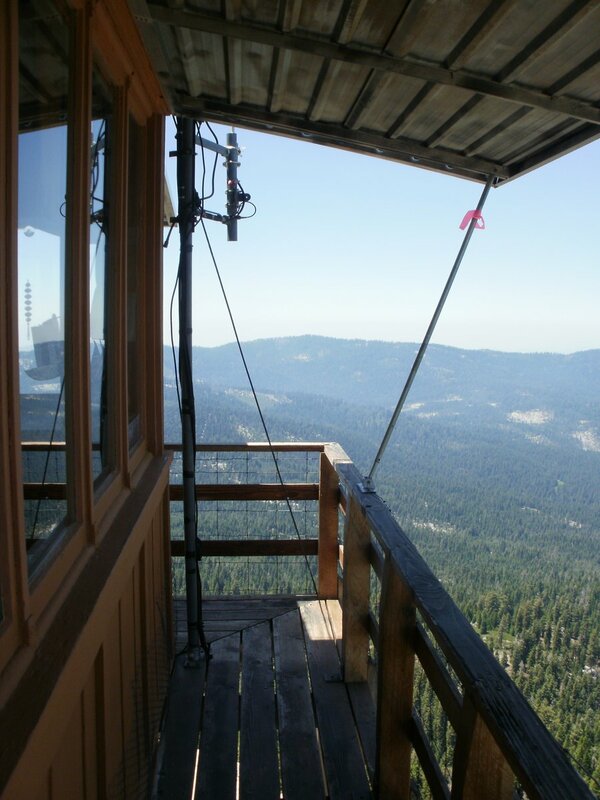 The current lookout structure has been in place since 1923 and is as impressive to experience as it is to look at. Buck Rock is a little difficult to find, and the dirt road could be in a little better shape, but it was worth the effort. 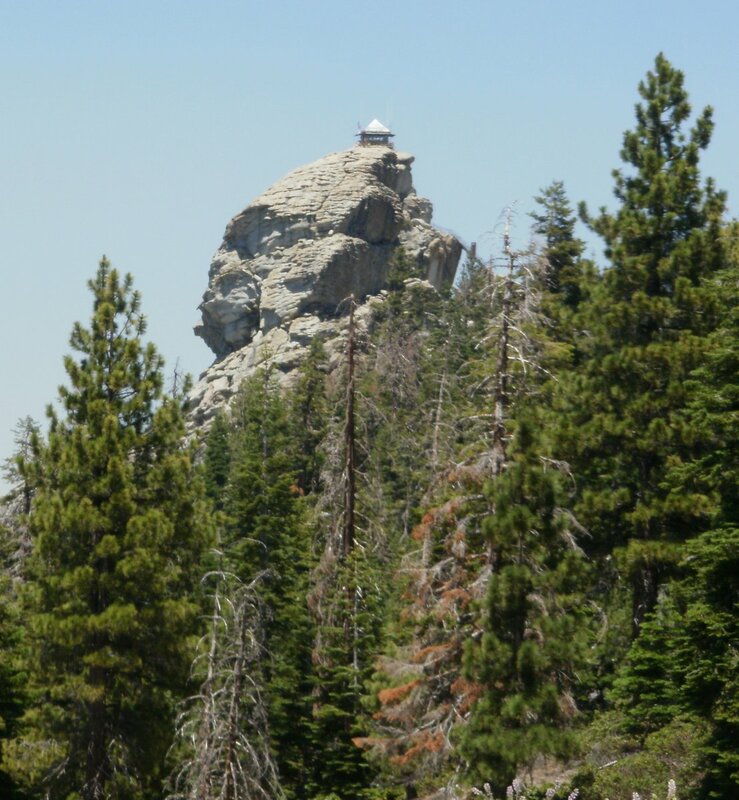 As we walked toward Buck Rock from the small unimproved parking area, we could see the wooden stairs we would climb to the top of the rock so we could checkout the small building that still serves as a fire lookout. There were only about 3 groups of people here at this time, less is better for this attraction. The stairs are wooden and are connected to boards that are about the same thickness as railroad ties, only longer. There are metal hand rails. Is I walked up the stairs I noticed that the stairs were in varying condition, with some really old looking wood, and some freshly replaced stair treads. 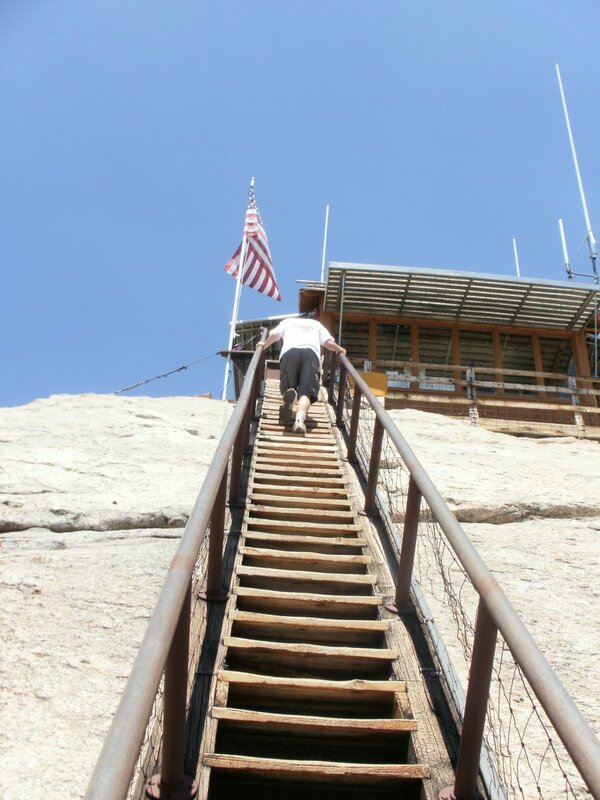 Even before you get to the top you can already see for miles and the ground is a long way down. However, the climb is at least half the fun. There is a security gate a little below halfway up that the Ranger can lock at night. This would keep away all but the most determined people and any animals. 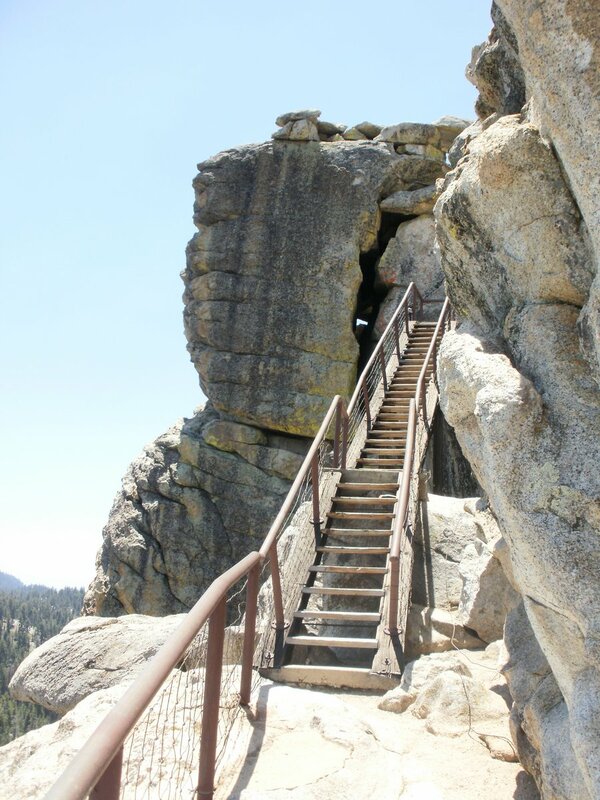 Just below the door is a concrete platform that sort of hangs out there… and the door is in a section of stairs that is suspended between two rock outcroppings with nothing but a lot of air below it. Once we were on the platform below the doorway my fear of heights really kicked in. I know my son experiences some issues with this too, so I asked him if he was doing OK. It sounds bad, but I was kind of hoping he would be freaked out and need to go back down. He said he was fine and headed up the stairs. I fell in step right behind him and felt much better once we started climbing again. Above the section of stairs with the door in it you walk along the a section of bare rock. Then there is a second set of stairs that just kind of hangs over nothing. The rock cropping at the top of this stairs was really interesting, and as you come around that corner you have one more set of stairs to the top. I had stopped to snap a few pictures so by the time I got to the platform my son was already near the top. By the time I got to the top he had already gone into the lookout; however, I decided to walk around the decking on the outside of the lookout before going in. 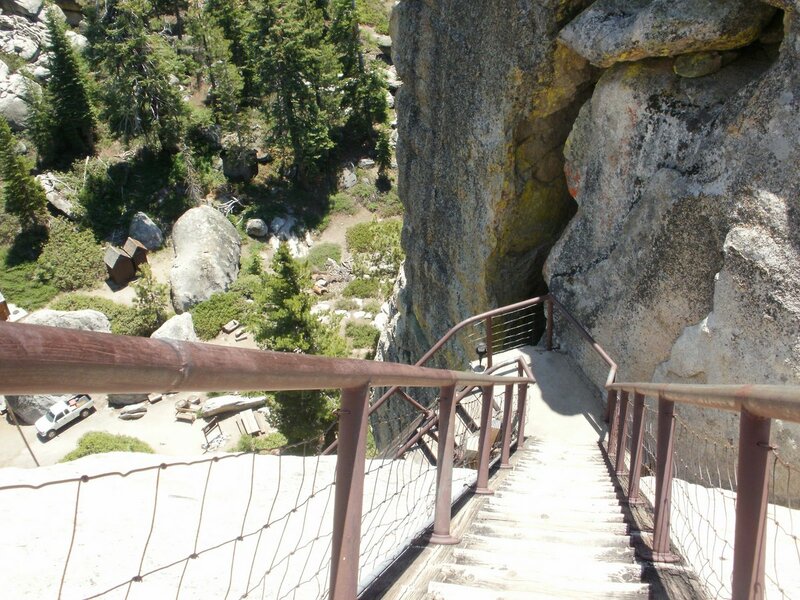 This decking hangs well out past the rock in several place, but my fear of heights had completely faded by then. The view was fantastic, the winds were very strong, but the whole structure appeared to be tightly strapped down to the rock with cables. The inside of the cabin was an eclectic collection of furniture and equipment from all different eras. Although the modern conveniences did not appear to be present, it looked like a comfortable place to work and live for short periods of time. The ranger happily shared some stories with us, some history, and she answered our questions. 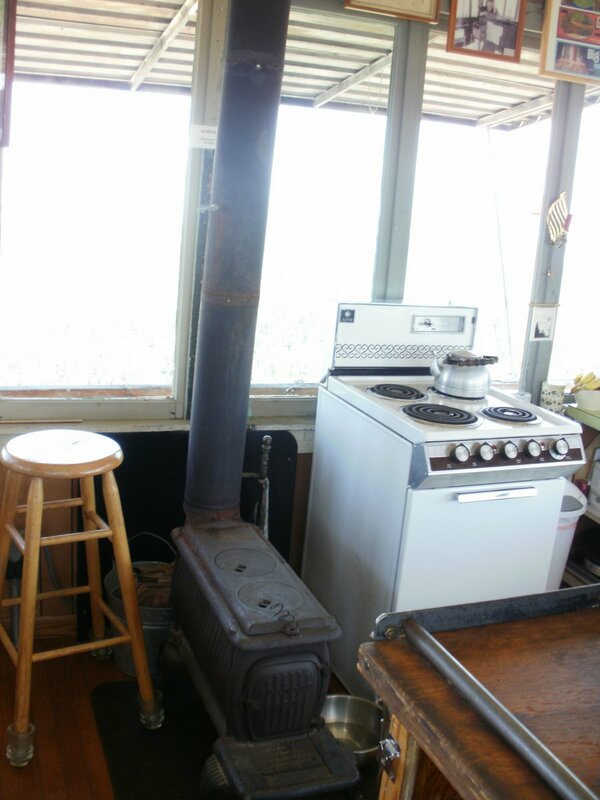 Although the wood burning stove/heater looked old enough to be original, she gave a much later date that it had been installed, I think in the 1940’s. One of my questions related to the maintenance of the cabin and stairway. She said they did constant maintenance, but that the length of time since different parts of the structure and stairway had been replaced varied. In particular, she mentioned that it had been about 17 years since they had replaced the decking outside the cabin… that gave me pause, since I had already walked all the way around them. I’m a little over 200lbs, so I let her know the decking must still be in pretty good shape. So I had done my part, testing the strength of the decking! We were reluctant to go, but another group came up so we left so they could receive the same friendly treatment we had received. As we headed back down I snapped a few more pictures. Here is the view from the top of the top most stairs. After Buck Rock Lookout we headed toward the park exit, but bypassed the exit to visit Grants Grove. I have definitely been to Grants Grove before. Although it was about 25 years ago, I remembered some parts of the grove, and one story in particular. My oldest son was about 7 years old at the time and loved the place. He was scrambling around on everything. 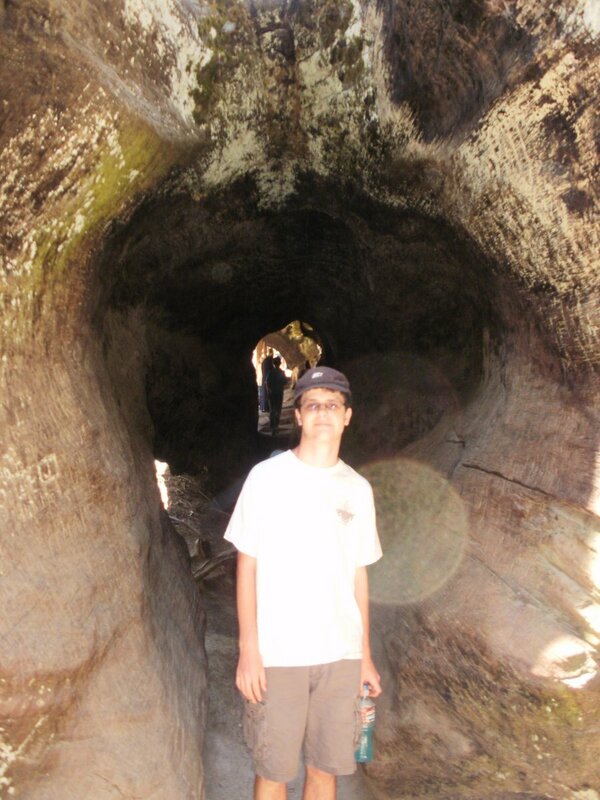 At one point he was walking along the top of a very large log laying along the inside of the trail. There was a lower area beyond the log, but it was impossible to tell how far the drop was on the other side. As we walked along his Mom looked up and yell, “He’s gone!” Chris had fallen or possibly jumped down on the other side. She was freaked out, but it turned out that it was no further down on other side of the log at that point and he was fine, just having a good time. Of course I got a little adrenaline rush, and told him to be careful, and I got a lasting memory! 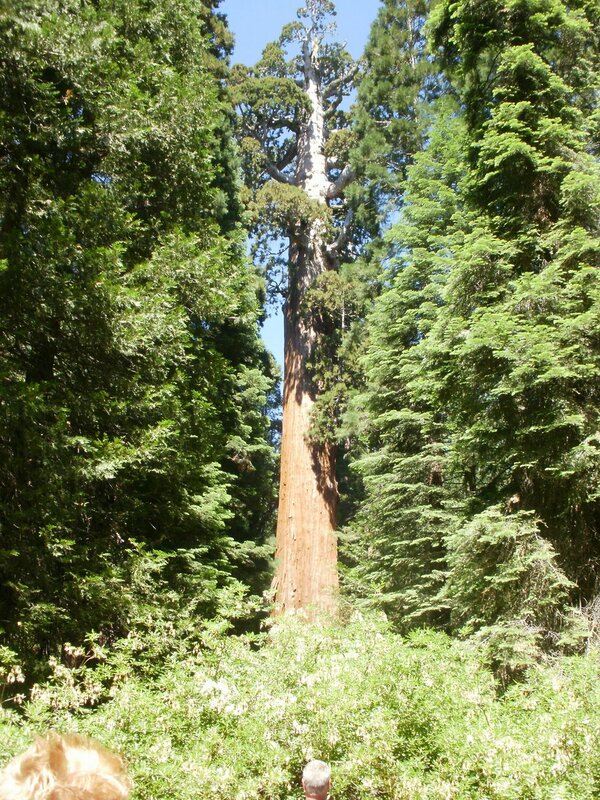 I also remember walking through this fallen Giant Sequoia on our previous visit. They have made it part of the path through Grants Grove. After Grants Grove we exited the National Park and headed home. Although we missed having Jenny on this trip, we had a very good time and lots of new memories! Click on the pictures in the(older) posts to view them full size! Like me on Facebook. In addition to putting links to new posts, I put notifications of post updates (adding new pictures, etc.). I also add posts about my milestones, stats, and other interesting facts about the blog.